It is tomato season my friends! 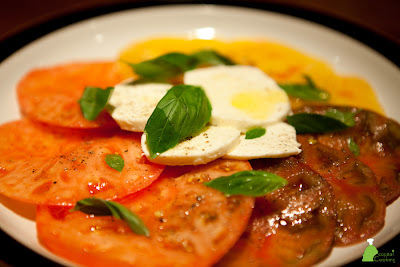 This Caprese Salad was featured on Cooking of Campania. I got my first taste in a small restaurant on the island of Capri about 15 years ago. You'll love the freshness of the tomatoes and the creaminess of the mozzarella. It is the perfect summertime treat! It is also featured in the Capital Cooking Cookbook. Drain the mozzarella and cut into 1/8-inch thick slices. Arrange the mozzarella and tomato slices alternately in concentric rings on a serving dish. Sprinkle with the basil leaves, drizzle with olive oil and season with salt and pepper. Keep in a cool place until ready to serve. *I also like to drizzle good balsamic vinegar on top.